I received my Airworthiness Certificate on Aug 8, 2006. My First Flight was Friday, September 1st, 2006. 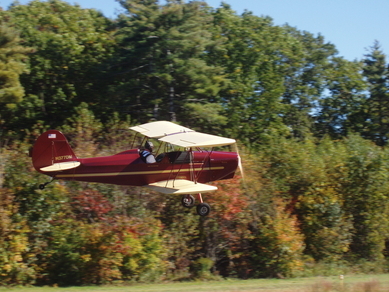 The little biplane jumped into the sky very quickly, no more that 300 feet of runway was used. Climb out was thrilling, and the landing was actually easy. A very docile little toy to say the least. Now that I have the first flight under my belt it is time to start performing the many flight-testing items called for in the FAA booklet on flight-testing. I will keep you posted. November 10, 2006 I now have just under 20 hours on the biplane. I did my first oil change yesterday and it looks good. The plane is very easy to fly and lots of fun! I have found no ill manners in any of the flight characteristics. The power off stall is a non-event, just sort of a mush with no hard break. The power on stall is different, a clear break but nothing out of the ordinary. Well now that summer is here I am flying again. I added an Oil filter to the 0200 and I hope that takes off about 10 deg off the oil temps. I get about 200F at cruise @ 2400 RPM. I would like to see about 190-200F. Climb is about 500 FPM @ 70 MPH and 2700 RPM, lower than I would like but it will have to do. Cruise is about 75-80 MPH at 2400 RPM. I land at about 70 MPH and carry a little power all the way to the three point landing. This plane has LOTS of drag!!!! You don't want to get slow as the sink rate is substantial! I swapped out the tires to new larger ones with more tread depth, see the gear section on this site. I added an oil cooler wrap from Aircraft S & S and ducted a cool air flow over it, now I get 190-200 oil temp on the hot days...I am happy with this result. The tail spring bolts were pulling down into the wooden mount in the tail, bending the big fender washers and all. I cut and fitted an aluminum backing plate which extends over the entire area in the tail, including straddling the lower longerons. This is now very strong and should prevent any further pulling of the bolts. The new tires are great and wearing well. I made a new, larger, windshield to give me more protection from the wind buffet. This Airplane is very fun and stable to fly, however, I only like to fly it in smooth air as it is so light. I mainly fly it early mornings or just before sunset on calm days. Well I had a great spring and summer flying my Bipe. I did not fly it nearly enough this summer! I wish I had more time to fly but life some how gets in the way. I was able to take up many people for fun rides this year. I completed my second annual condition inspection and everything looked great. I have 65.0 hours on her as of today, 9-9-08. I'd like to get 10+ more hours of flying the bipe before I put her to bed for the long winter. I am so picky on the weather I fly the Bipe in so that limits the days to go up. Well the fun of flying this little toy keeps getting better each year! I got stuck in 20+ Kt winds for a spirited flight to home base! Although I was busy with the stick and planted my landing hard she handled well. Still, I mainly enjoy smooth air! Keep building and flying! I had a fun biplane season this year. I did not fly as much as I would have liked to as it seemed to be a very windy summer. I put about 25 hours on the little bipe this year. Some rides were given to new passengers which is always fun. Many rides were given to repeat passengers, that is a good sign! I have flown in temps down to the upper 40s F and it was COLD! The weather was very unique today as it was both warm, 58F, and calm. Usually when we get the odd warm day in the winter it is accompanied by strong winds. Not so today! I took 7DM up for about an hour of the most surreal smooth air flight I have ever had! What a treat! She is now back fast asleep for the rest of the winter. Well this spring in New England has been cold, wet and windy. I have been up a few times but only in my winter clothing and snowmobile suit! I am looking forward to warmer days ahead. Well I seemed to have skipped an entry for 2012 but much fun was had putting around the countryside low and slow killing bugs. I have found using a Lightspeed Zulu 2 headsets paired with my Droid streaming Pandora is a fantastic set up with good audio quality. The addition to music makes flying the little bipe even more fun! I have been out flying and having a great time. There is no flying more fun and enjoyable than piloting an open cockpit biplane! I fly by myself most of the time now that my kids are all grown and do not fit into the front any longer.